Like all classrooms, we strive to ensure that our kids are engaged with cognitive learning as often as possible. The trouble lies in "What engages their brains best?" and "How do we even know?" Too often I see kids sat behind screens looking engaged in what they've been set, yet in actual fact they are simply engaged in deception - How can I look busy and thoughtful while actively practicing avoidance? This is a skill that our kids develop early. I am lucky in teaching the younger ones, that this skill is not yet fully developed and is quite easy to spot. Despite this, keeping kids actively engaged in meaningful learning is a complex task. I've written many times about the importance of Key Competencies to actively drive academic learning. When teaching through key competencies, activities and experiences can't help but become engaging, fun and active. Collaboration, respect, self management, thinking, creating, critiquing and communicating - vital skills to hang the three Rs on. I don't believe that children should be sitting anywhere ever for too long - our classroom designs now allow for more spaces, flexible spaces and different spaces. With multiple teachers in a space we now have the possibility to have a variety of activities and opportunities to suit all kinds of learning. We need to harness these possibilities and not just have kids sitting at tables, behind screens for the majority of their day. Now that we are over halfway through the year, the 80 children in our space are a well oiled family. 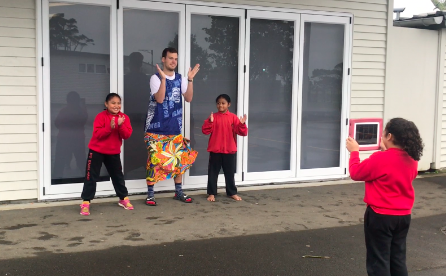 We've spent 20weeks establishing our whanau and the kids are all ready to fly with their learning and have some fun doing so. We're encouraging our kids to branch out with their creations and learning. We're having statues built, Sketchnotes created, dances danced, paintings painted, Lego towers constructed, discussions shared, movies filmed and songs sung. The children can't help but be cognitively engaged when the process and outcome involves laughter, sharing and showcasing their talents. School is fun - just as it should be. They are kids after all. We have three teachers in our space. Three very different teachers. Three teachers whose skills and personalities compliment and support each other in a classroom. We each take different learning areas and share our expertise not just with the kids, but each other - what a great opportunity for constant PD. My strength lies in teaching kids through creative measures, developing key competencies - keeping school fun yet also about the learning. 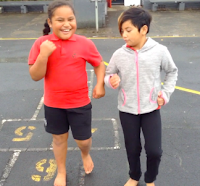 So we've taken our theme for the term - Move Ya Body - quite literally and have had the kids make a dance movie a week. 80 kids all at once - dancing, filming, arguing, laughing - it's buckets of fun! It's easy and if the class has a well established kaupapa of whanau, it's painless as well. - Let the kids do it! We use Video Star as our MTV iOS App of choice. 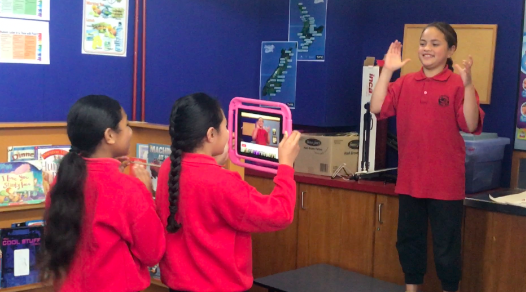 It is so easy because the app syncs the music to your filming and the kids can't help but get it right. 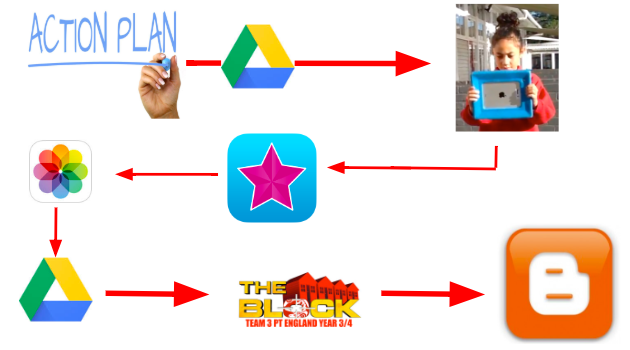 The kids access the music clip from our shared Google Drive folder via our class site. They film in friendship groups - with the class kaupapa of "No one is left out". They share the completed product back to the same Google Drive folder. The movie is then ready to embed in their blog by again accessing it via the class site. The technology and workflow is fairly simple to manage if the account is signed in on the iPads and the kids are familiar with using the class site and their blog. The real learning lies in in those powerful KCs. Working with others, sharing, self and group management, thinking and creating. For the groups where those KCs function well - the outcome, the movie produced, is always of a higher standard than those groups where the KCs fell down. As a whole class of 80, we view every movie and critique the movies - identifying the good points and discussing, respectfully, what went wrong. This is such a powerful process that the whole class owns and respects. With well established cultural norms there are no putdowns or negative moments, as all the kids know that we are in it for the learning. A couple of our favourite examples are here and here.